What are the connections between military action and material extraction in the U.S.? How do we understand a bigger system that was written for us, before us, and by proxy perpetuated by us? The ever presence of objects with violent histories undeniably draws out the connections and contradictions we live with everyday in the U.S. With an expanding military economy and slow erosion of public services, the sculpture titled, Everything At Once, engages not in silence or silos but instead turns outward to reimagine public life together. 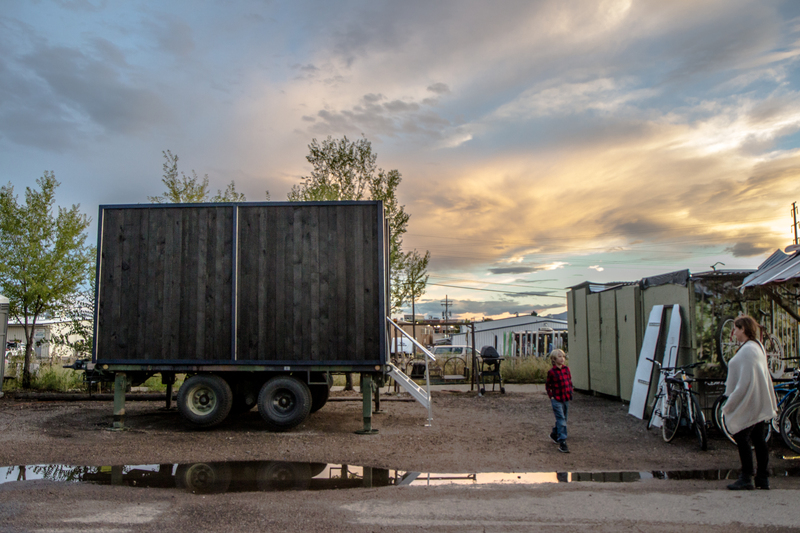 Charred wood from a U.S. public school, a military trailer used in Afghanistan, an agricultural tank, plants, and light make a bridge for communication and a platform for contemplation. Everything At Once asks: can we process complex histories through the transformation of objects in order to collectively imagine other ways of being in the world? Mary Mattingly is a visual artist whose work has been exhibited at the International Center of Photography, the Seoul Art Center, the Brooklyn Museum, the New York Public Library, deCordova Museum and Sculpture Park, and the Palais de Tokyo. With the U.S. Department of State and Bronx Museum of the Arts she participated in the smARTpower project, traveling to Manila. In 2009 Mattingly founded the Waterpod Project, a barge-based public space and self-sufficient habitat that hosted over 200,000 visitors in New York. In 2014, an artist residency on the water called WetLand launched in Philadelphia. It is being utilized by the University of Pennsylvania’s Environmental Humanities program. Mattingly has been awarded grants and fellowships from the James L. Knight Foundation, Eyebeam Center for Art and Technology, Yale University School of Art, the Harpo Foundation, NYFA, the Jerome Foundation, and the Art Matters Foundation. Her work has been featured in Aperture Magazine, Art in America, Artforum, Art+Auction, Art News, Sculpture Magazine, China Business News, The New York Times, New York Magazine, Financial Times, Le Monde Magazine, Metropolis Magazine, New Yorker, The Wall Street Journal, the Brooklyn Rail, the Village Voice, and on BBC News, MSNBC, Fox News, News 12, NPR, WNBC, New York 1, and on Art21’s New York Close Up series. Her work has been included in books such as the Whitechapel/MIT Press Documents of Contemporary Art series titled “Nature” and edited by Jeffrey Kastner, Triple Canopy’s Speculations, the Future Is… published by Artbook, and Henry Sayre’s A World of Art, 8th edition, published by Pearson Education Inc.